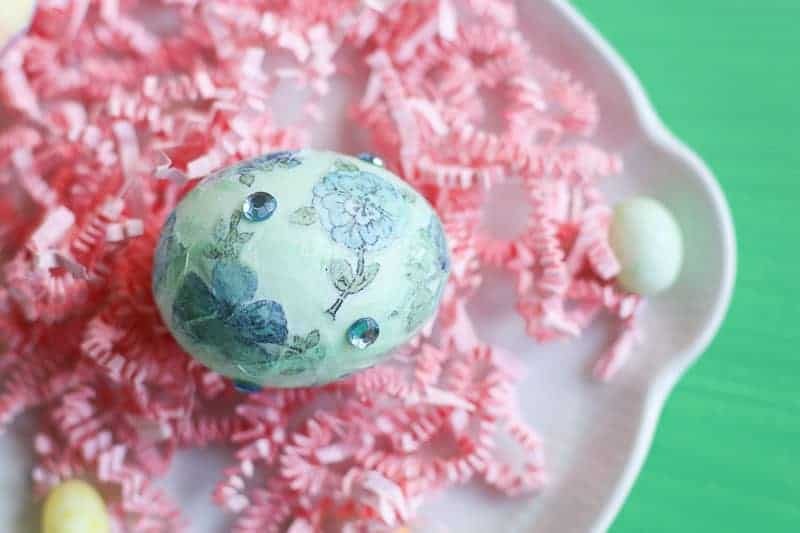 This is an easy tutorial on how to Decoupage Easter Eggs! 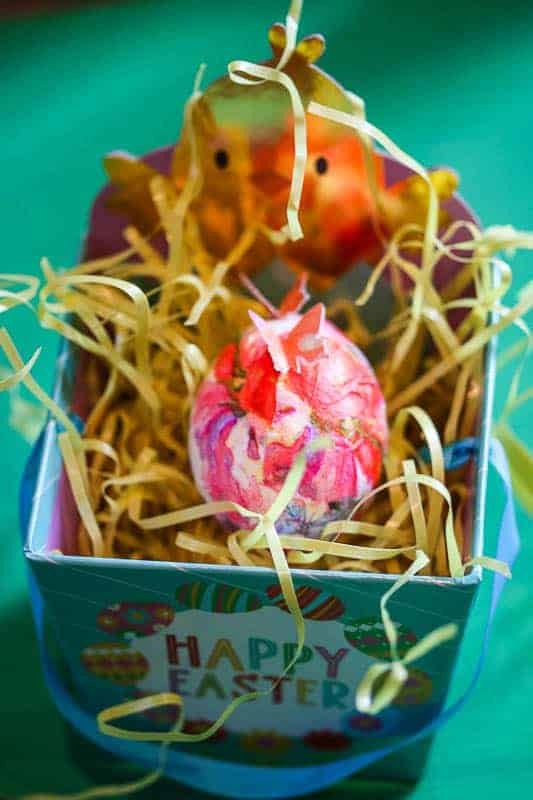 , tissue paper, craft jewels, glue, scissors, and imagination! 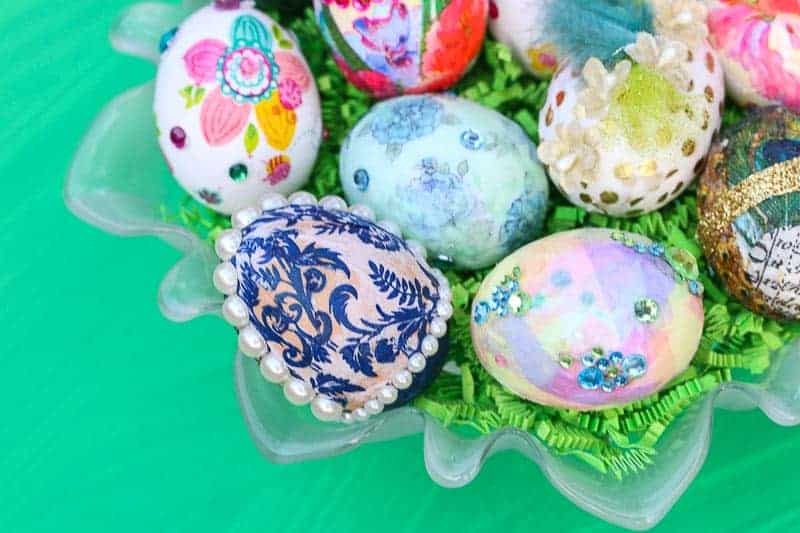 Today I am going to explain how to decoupage Easter Eggs! I get ALL into Easter. During the month of Easter, I display little bunnies and eggs EVERYWHERE in my house. I have grown quite a collection of eggs. I have some I have purchased from my travels. I have some from taking my children to the Easter Egg Rolls at the White House. And I have some that the children have made over the years. 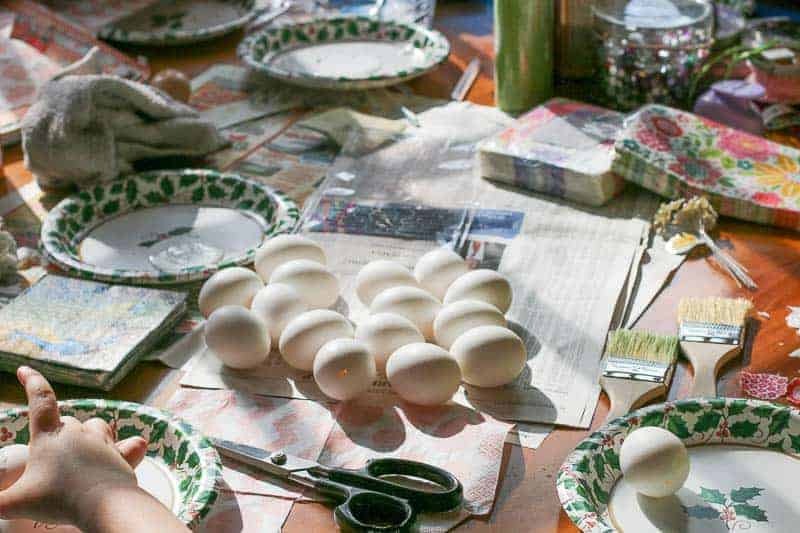 They are each special in their own way and pulling them out every year brings back those happy memories that are associated with each particular egg. 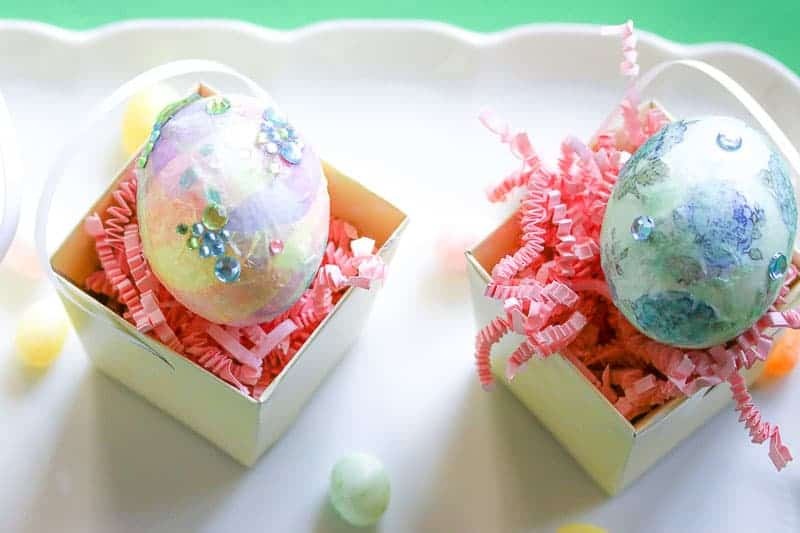 This year, we wanted to create a something a little “more grown-up” and a little something “Eggs-tra Special,” so we decided to try decoupage. We hollowed out some eggs by carefully creating a tiny hole with a pin on the top and bottom of each egg, then blew out the yolk. 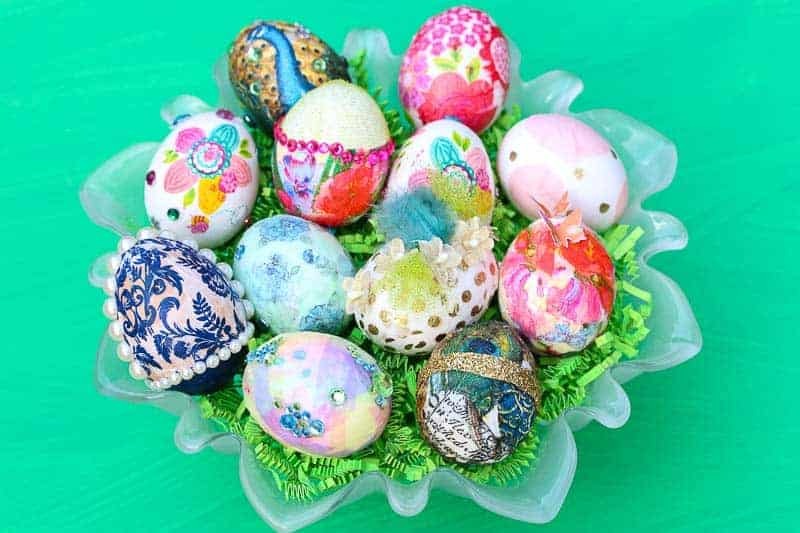 You can use boiled eggs if you want to eat them, but I wanted to keep our little works of art. I then gathered Mod Podge, pretty napkins, tissue paper, paint brushes, craft jewels, scissors, card stock, and a glue gun. We poured Mod Podge glue on a paper plate for easy access and got to work! We found it was best to cut out the designs or cut paper in pieces to glue on rather than trying to glue one whole napkin sheet. It gets very wrinkly if you try to glue too big of a piece. Also, if you are using a napkin, separate the napkin layers. Keep the printed layer and discard the white layer. 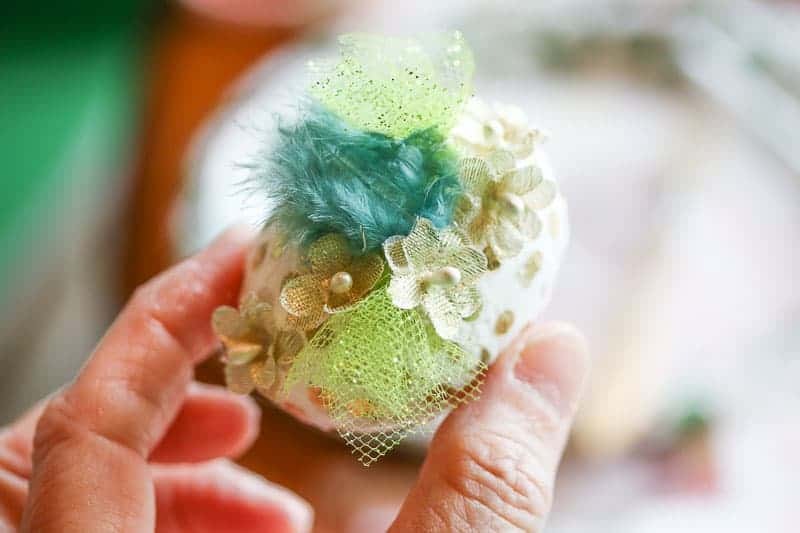 Brush Mod Podge onto each area on the egg where you will glue down your paper. Lay down the paper. Then brush another layer of Mod Podge over the paper to seal it. Allow it to dry before adding anything additionally. This requires just a little patience. It dries fast. We found it worked well to work on two eggs at one time to allow one egg to dry while you are working on the other egg, alternating them, until both are finished. 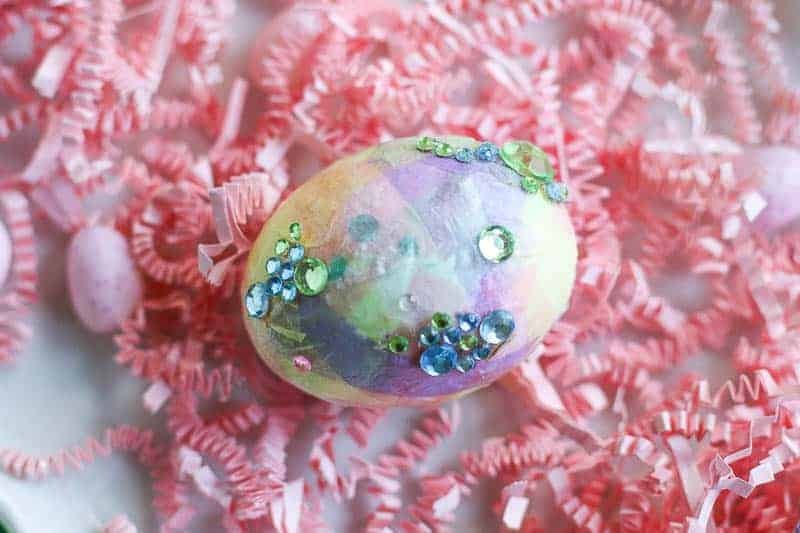 This egg was created by decoupaging the napkin. Then after it dried, we added craft jewels. Isn’t it stunning? Here we decoupaged tool at the top and a napkin on the bottom. Then we added craft jewels around the center.
. Then we hot glued tiny flowers and finished it with a little tool and feathers. 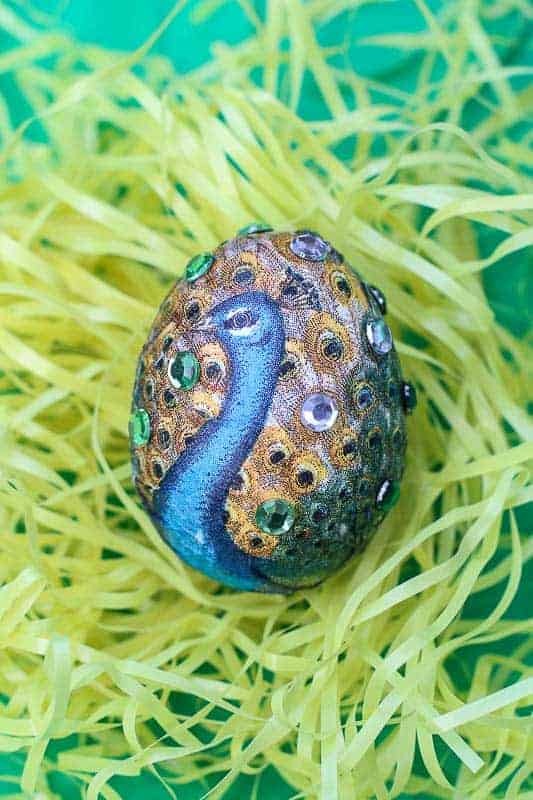 It is a tiny work of art! then hot-glued them on. Don’t you love the 3-d dimension? 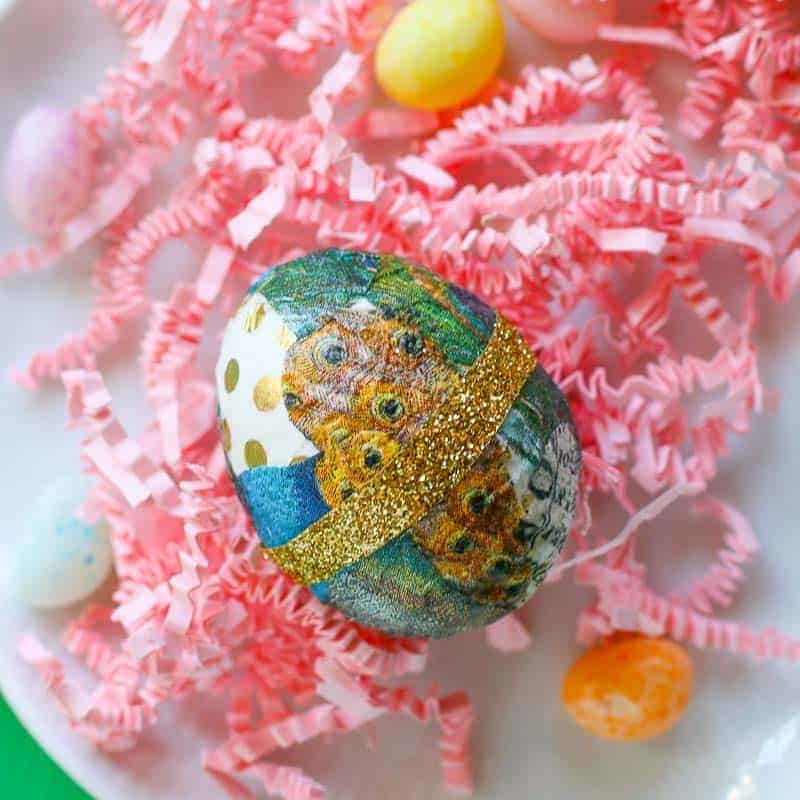 I am going back and making an egg covered in butterflies next time! 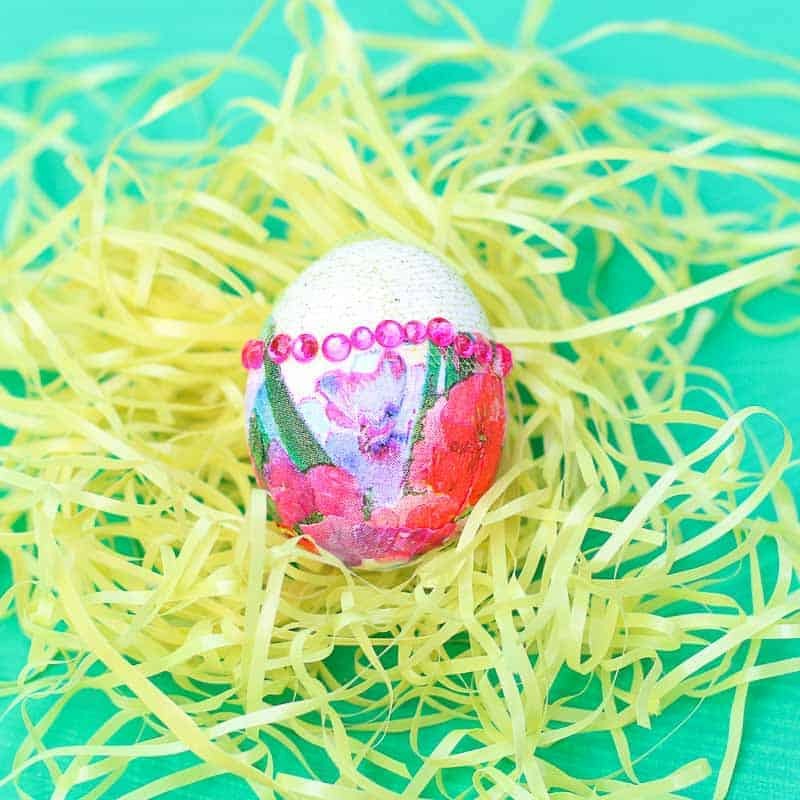 On this egg, we cut out flowers from a card stock and decoupaged them on. Then we added a layer of tissue paper and decoupaged that over it. Then we glued craft jewels for the perfect finished touch! 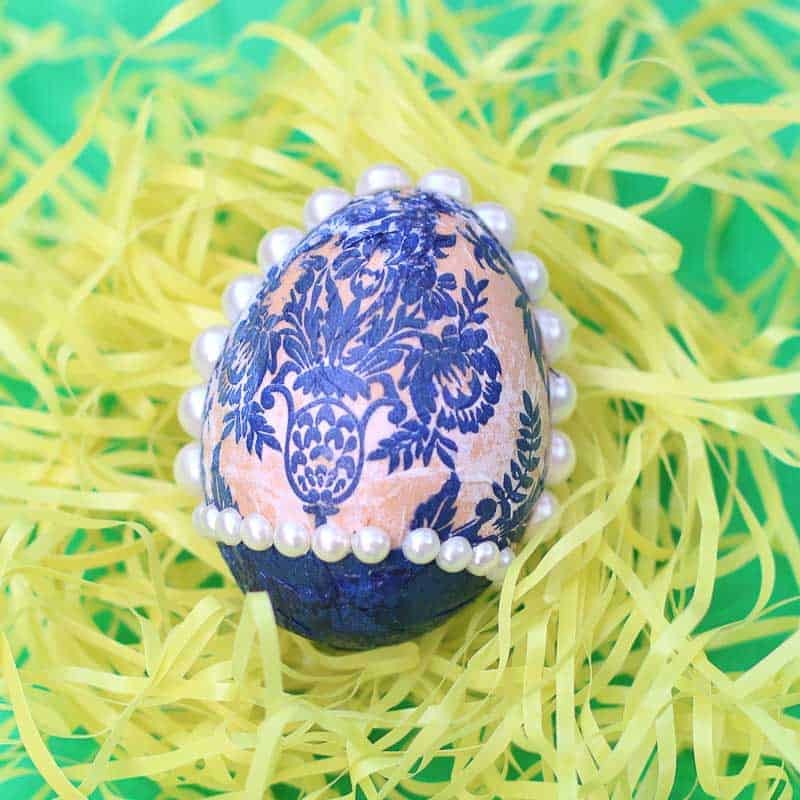 This egg was decoupaged with a pretty patterned napkin. Then we glued pretty craft pearls. Isn’t it lovely? 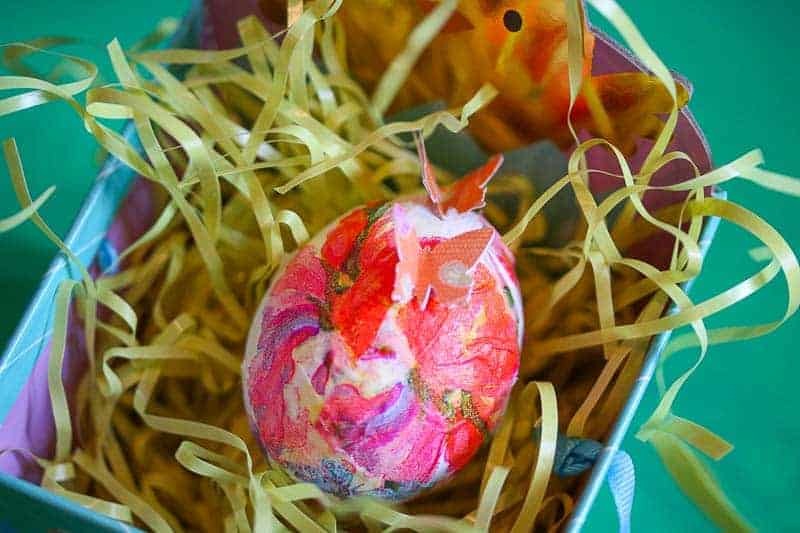 This egg had a combination of napkin and tissue paper glued to it. Then a gold ribbon was added to it to give it that perfect little touch! 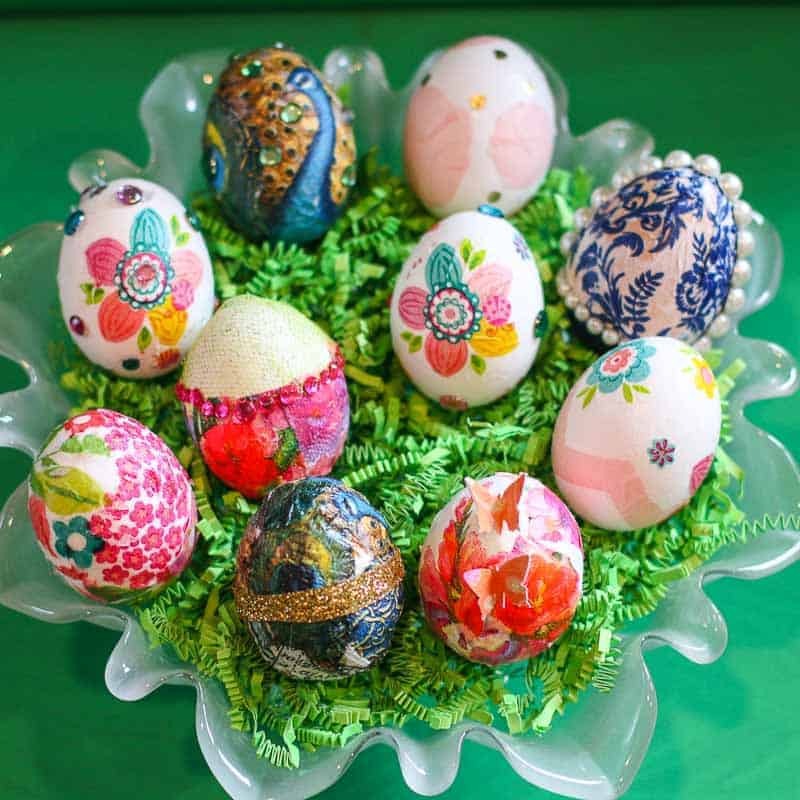 I hope we inspired your Inner-Easter-Creative-Artist-Self to go and make some BEAUTIFUL eggs. I had so much fun. If I can do it, I promise, anyone can do it! HAPPY EASTER! 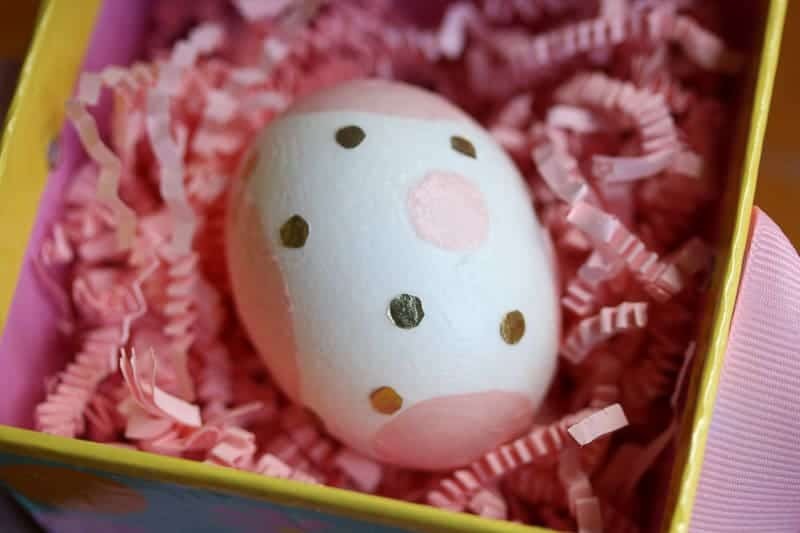 If you enjoyed this article, check out: Pretty Kitchen Towel Tutorial, and Halloween Spider Deviled Eggs. 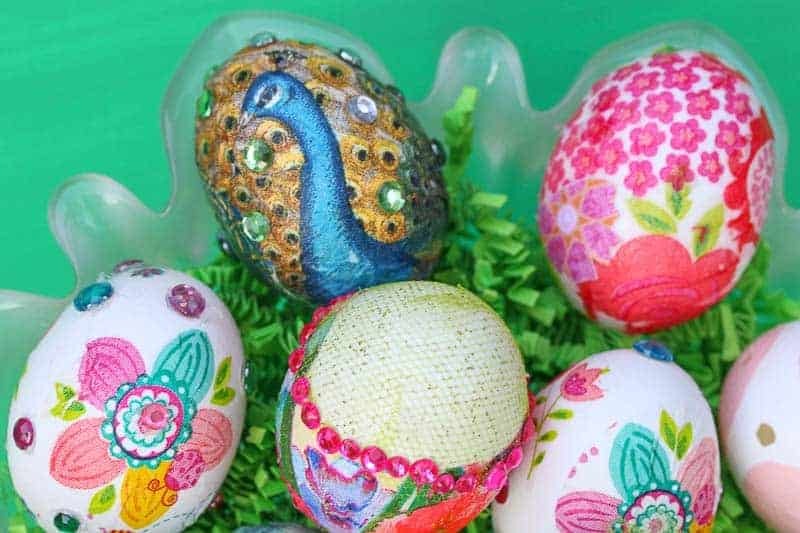 All of your eggs are stunning. It is like one tiny masterpiece after another. I really like how you embellished them! Happy Easter to you. I’m going to pin this and also share it. Girl, is there anything you cannot do??? I’m beginning to think you are the most perfect person in the world! 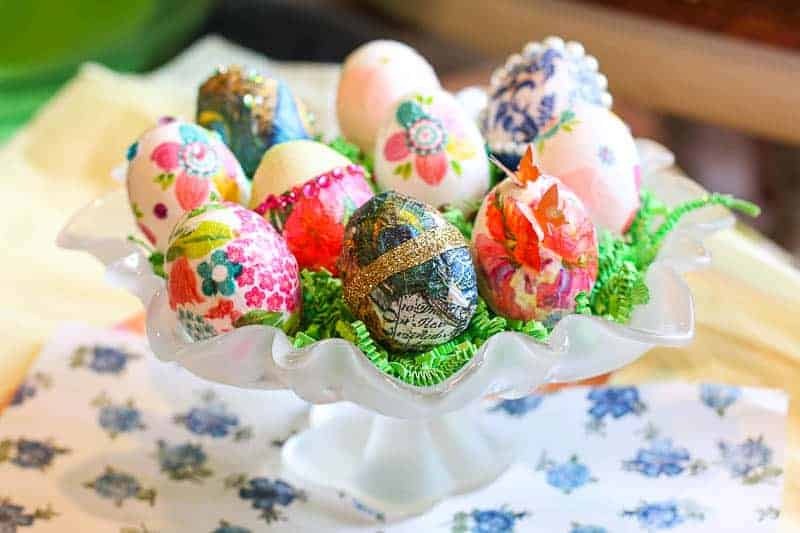 And I’m sure your Hubby and kids will agree with me 😉 These eggs are so gorgeous and I’ve never thought of decorating them like this. Love it! Enjoyed meeting you today. Best of luck with your upcoming interview with Alton Brown. Can’t wait to read it! As an old foodie, I’m loving the blog. As a board member of the Fayetteville/Cumberland Countt Arts Council, I’m loving the style and creativity in your stories.